Approximately six million Americans aged 65 an older suffer from depression, although experts estimate as little as 10 percent receive proper treatment. Despite popular belief, depression is not a part of the normal aging process. Unfortunately, late-life depression is often overlooked or confused with the effects of age-related illnesses. What signs and symptoms of depression should caregivers and loved ones be on the lookout for? How can home care software help? Unexplained weight loss or weight gain. It’s common for seniors to overeat or not eat enough when they are depressed. Caregivers using ClearCare’s home care software can easily track the senior’s mealtimes and take note of unhealthy habits. Social withdrawal. 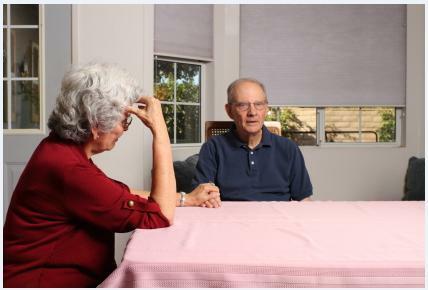 Elderly persons generally love visits from friends and family, so if you notice a senior in your care withdrawing from such visits it may be a sign of depression. If an active senior is now reluctant to leave the home, he may be tired of battling his depression and simply prefer to be alone. Irritability or behavioral changes. If a friendly and outgoing senior is now uncharacteristically quiet and reserved, make a note of her behavior. Any changes in mood or habits can indicate depression, so it’s important to monitor each senior closely. With a reliable home care system from ClearCare, such monitoring is easier than ever. Trouble sleeping or sleeping too much. Caregivers who notice changes in their patient’s sleep patterns should alert the family that depression may be the cause. Keeping track of the senior’s bedtime and wake time schedule is easy using ClearCare’s home care software. Caregivers can make note of any changes and ClearCare’s reliable home care system makes this information available immediately. Persistent or vague complaining. If you ask a senior outright if he is depressed, he will likely answer “no” – even if he actually is. Seniors may view such an illness as a weakness. This doesn’t mean he won’t ever make his unhappiness known. Persistent complaining can be a sign of depression – whether the senior attributes it to aches and pains or simply growing older. If you are concerned about a loved one’s potential for depression, make sure you mention this to your home care agency. The agency will use their home care system to alert caregivers that they should be on the lookout for signs of depression. ClearCare’s exceptional home care system will keep you, the caregiver, and the agency “in the loop” of your loved one’s care. Stay tuned for our upcoming post “3 Ways Home Care Software Helps Manage Senior Depression” for more helpful tips and tricks.